Remember the crack biscuits? Well, I now bring you crack cookies. These are the best vegan cookies I’ve ever had. EVER. 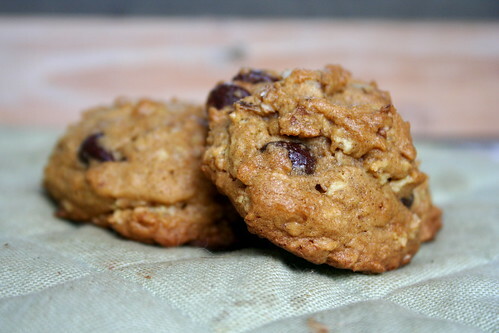 Granted, I’m a cookie snob, but these are chewy and moist and crunchy and chocolatey and not too sweet and nutty and. There are a lot of ands I could keep adding on. And I’m sure there’s some cardinal law that says you can only put so many things in a cookie before it’s overkill. But the combo is just right. Just enough good things (pumpkin, oatmeal, pecans) and just enough not-so-good-for-you-things (chocolate and sugar). They are amazing. And you need to go make them right now so that you’ll believe me. I’m going to gain 12 pounds this winter if this keeps up. But they are so so so good. Beat the Earth Balance and sugars together until light and fluffy, about 3 minutes. Add the apple butter/sauce, vanilla, and pumpkin puree and beat for another 3 minutes. In a separate bowl combine the flour, oats, baking soda, salt, cardamom and cinnamon and whisk together. Slowly add it to the butter mixture until just combined, being sure to scrape down the sides and bottom once or twice to ensure even mixing. Fold in the chocolate chips and pecans. Drop spoonfuls of dough on cookie sheets lined with parchment paper. Bake for 13-15 minutes. Allow to cool on the tray for a minute or two to set, then move to a wire rack to finish cooling. They sound yummy! They also sound like they need some nutmeg, cloves, allspice, and maybe some cayenne pepper in them. Oh. My. Cookie. God!! That’s just perfect, I don’t think it gets any better than that! oh good, another vehicle for pumpkin! yay! That’s a LOT of sugar!! But they do look yum! we share a brain! I made pumpkin cookies too. yours are killah! Ooh these look so good! I’m so excited because pumpkins are starting to make their appearance at the market, so I’ll be making up some pumkin love soon! How many does this make? It sounds like a huge delicious amount of cookies. Ooh I just got a Sugar Pie Pumpkin at the market today. I think I may need to try this!